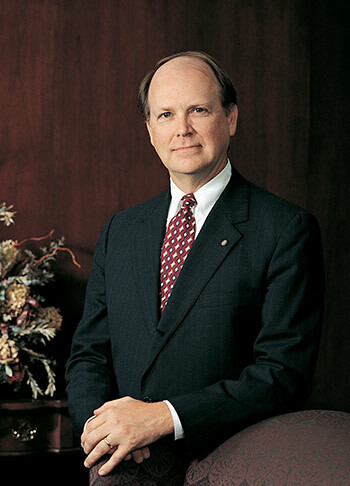 Charles Plosser served as dean of Simon Business School (then known as the William E. Simon Graduate School of Business Administration) from 1993 to 2003. The work of Charles Plosser, former dean of Rochester’s Simon Business School and past president of the Federal Reserve Bank of Philadelphia, was the focus of the Carnegie-Rochester-NYU Conference on Public Policy, held at the University this past April. It was the 91st meeting of the seminal conference, held twice a year since its founding in the 1970s by Karl Brunner, who became the Fred H. Gowen Professor of Economics at Simon, and Allan Meltzer, a professor of political economy at Carnegie Mellon University’s Tepper School of Business. More than 75 economists and public policymakers attended the gathering last week. “The conference discussions are all about bringing the best thinking to how policy is—or should be—articulated and executed,” says Thomas Cooley, a professor of business and international trade at New York University and one of the event’s organizers. The discussions have deeply affected the whole course of macroeconomics in the past 40 years, according to Cooley and others in the field. Plosser is known for his work on real business-cycle theory. Narayana Kocherlakota, the Lionel W. McKenzie Professor of Econonics at Rochester, who, like Plosser, is a former Federal Reserve Bank president, was among those who presented papers. Others presenting papers or participating in roundtable discussions were scholars and policymakers from an array of institutions including the University of Pennsylvania, Columbia University, the University of Oslo, Stockholm University, Jiao Tong University, and the Federal Reserve Bank of St. Louis.